Our Postcard Barrel is set up and ready – it even made the front cover of the Tri-City News on Saturday! The barrel project is based on the Post Office Barrel on Floreana Island in the Galapagos. An English whaling captain started the tradition of having a barrel with unstamped letters on the island so that sailors starting out on a voyage could leave their letters there for other sailors returning home to hand deliver. Today, instead of whalers, tourists leave postcards in the barrel for others to deliver. We found out about this barrel a few months ago when some Museum staff members sent their own postcards into the barrel as a result of reading about it in the Tri-City News. We got in touch with Kyle MacDonald, the Port Moody Secondary grad who delivered our postcards and is working on a book about his experiences delivering postcards. Turns out Kyle wants to set up other barrels around the world, with one per country. He already helped install one in Crete. So Canada’s Official Postcard Barrel is here in Port Moody now. We have three barrels in the Museum’s collection. First we used an extra small one. It was too small. Then we decided to use the biggest barrel in our collection. It took some work getting the barrel out of the Museum’s vault. After we installed the barrel, we realized something. It was too big. Luckily we had another barrel upstairs on display. Sisal Sweeping Compound is “a heavy duty compound built for use on concrete or wood floors in factories, garages and warehouses where heavy soil loads exist.” It has dust-absorbent wood fibre mixed with oil and sand and is red. We’ve got a few postcards inside already. 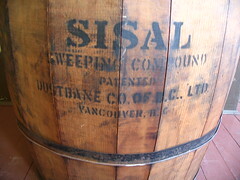 There is no more Sisal Sweeping Compound in the barrel. This is excellent…what a great idea for Port Moody and so great that you have a Port Moody grad who is writing a story, too! I hope you do lots of follow up on this one.